Mayflower II, built in 1955-6 and currently under restoration in Mystic, Connecticut, prior to its planned return to Plymouth in time for the 400th anniversary of the arrival of the original Mayflower in 1620. The Fortune, which brought Thomas Prence and 33 other settlers to Plymouth Colony in the following year, was only one-third the size of this ship. This pedigree chart was published in a 1942 book entitled Personal Religion by Douglas Clyde Macintosh, a Professor of Theology and the Philosophy of Religion at Yale University who used his own family history in England and colonial America to illustrate the association between non-conformism and what he termed ‘personal religion’. He was the grandson of Cotton Mather Everett, at the bottom of the chart, a ship’s physician with the East India Company who settled in 1832 in Canada. The Everetts were a prosperous family of clothiers in Heytesbury, Wiltshire, where their line can be traced back to the 16th century. One of Cotton Mather Everett’s brothers, Edward Jackson Everett, had a daughter Octavia, who married John George Gibbins – my great-great grandparents. This pedigree chart is therefore also my own. What particularly interested Macintosh was his descent from John Cotton (1585-1652), one of the pre-eminent theologians of early New England. The son of a Derby lawyer, John Cotton studied at Trinity and Emmanuel Colleges, Cambridge, before becoming Priest of St Botolph’s Church in Boston, Lincolnshire, where he advocated dispensing with the liturgy and vestments of the Anglican service – views similar to those of the Puritans who left on the Mayflower in 1620 to found Plymouth Colony. Cotton’s teachings brought him into increasing conflict with the Anglican establishment, and he and his wife Sarah left for the Massachusetts Bay Colony on board the Griffin in 1633. Once in Boston (named in 1630 by several of his congregation from Boston, Lincolnshire, who had preceded him there), he became minister of the church and played a prominent role in debates about the nature and governance of the church in the colony, publishing many books and pamphlets up to the time of his death in 1652. 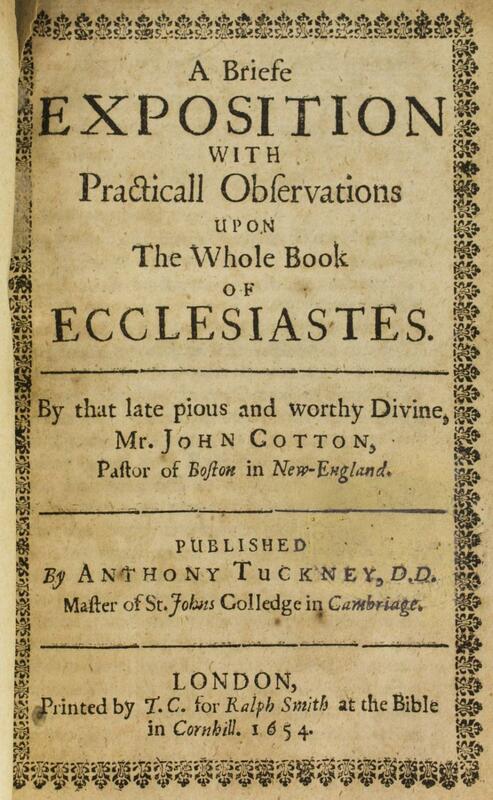 One of numerous works by John Cotton, this one published shortly after his death. John Cotton founded the Boston Latin School in 1635, and a year later was one of the founders of the college that would become Harvard University. His son Seaborn Cotton (1633-1686) – born during the voyage of the Griffin to America, hence his name – attended Harvard, as did Seaborn’s son Roland (1674-1725); Seaborn became minister of Hampton, New Hampshire. Seaborn’s sister Mariah married Increase Mather, President of Harvard from 1692 to 1701 and father of Cotton Mather, best-known for his involvement in the Salem Witch Trials but later a Fellow of the Royal Society. According to one account, ‘… it is believed that the Cotton family in its various branches has produced more men of the clerical profession than any other in New England.’ Bucking this trend, Seaborn’s son Roland left America in 1700 to study medicine in England and Holland, and settled in Warminster, Wiltshire, where he married and worked as a physician; he was the last of my ancestors in that line to have lived in America. In Personal Religion, Douglas Clyde Macintosh’s interest in his colonial ancestors was largely restricted to John Cotton and his theological journey, and to the connection that Macintosh could find between that and the non-conformist beliefs of the Everett family in the 18th and 19th centuries. However, his ancestry was more diversely rooted in colonial America than this suggests. Seaborn Cotton’s wife Prudence, born in Ipswich, Massachusetts Bay Colony, in 1637, was the daughter of Jonathan Wade and his wife Susannah (née Prence), who had arrived from England on the 1632 voyage of the Lyon. Jonathan was a merchant who became a Representative to the General Court of Massachusetts, lived through King Phillip's War against the Wampanoag (in which his son eldest son, also Jonathan, served as a militia officer), came to own land that may have amounted to several thousand acres, and at the time of his death in 1683 had an estate valued at nearly 8,000 pounds, making him one of the wealthiest men in 17th century New England. Prudence was one of four daughters and three sons, several of whom married into prominent colonial families and whose lives and descendants are well-documented, especially here. Plimoth Plantation, the living history museum at Plymouth, Massachusetts, that attempts to replicate the colony as it would have been about the time that Thomas Prence arrived in 1621. An even earlier arrival was Thomas Prence, thought to have been Susannah Wade's elder brother, one of 34 passengers to land at Plymouth in November 1621 from the Fortune – the second ship to be sent out with colonists to Plymouth, following the Mayflower the year before. Aged only twenty, he was one of the ‘lusty young men, and many of them wild enough’ who at first dismayed the surviving colonists, but then provided them with much-needed labour. Prence did well for himself, marrying the daughter of a Mayflower pilgrim and in 1634 becoming Governor of Plymouth Colony. Even by that date, when the colony had become well-established, its population was probably fewer than 400; when Thomas arrived in 1621 it had been a mere 46 people. The Fortune itself was barely a seagoing ship, at 55 tons being less than a third the tonnage of the Mayflower. It was the fortitude needed to undertake those voyages and thrive in the conditions of the new colonies that makes the lives of these early settlers so fascinating, whether or not their main motivation was to discover a ‘personal religion’. A map of early New England showing the relationship between Plymouth Colony, founded in 1620, and Massachusetts Bay Colony, founded a decade later and focused on Boston (source: Encyclopedia Britannica).